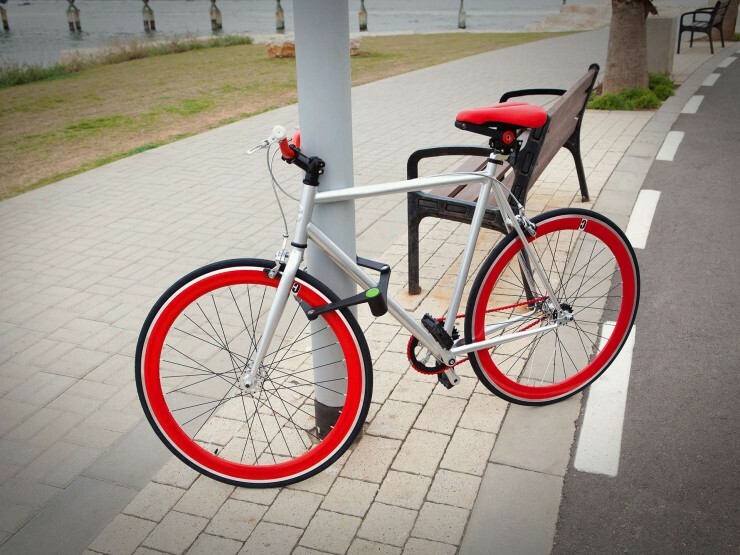 There are many ways to secure your bicycle when away from home, and the FoldyLock appears to be one of the better ones. It’s a 90cm (35.5. inch) long lock made up of “six hardened steel links covered with plastic reinforced with fiberglass to protect your bike frame from scratches. Connecting rivets are designed with VSR rivet technology against drilling. Foldylock is rust free and has an anti drilling cylinder that is protected in a hardened steel housing.” You can pack it tight and carry it where the water bottle would go in its designated case, or just toss it into a backpack. Hardened steel is hard to cut, but more importantly, the tough appearance of the Foldylock may deter would-be thieves just by looking harder than normal to defeat. They’re more likely to move on to the next guy tying his bike with a flimsy chain than they are to try and cut through solid steel. The Kickstarter is fully funded, but you can still get your own for $80. By David Ponce on 09/03/13 • Leave a comment! When you’re on two skinny wheels sharing the road with multi-ton 18-wheelers, you can get a little nervous. 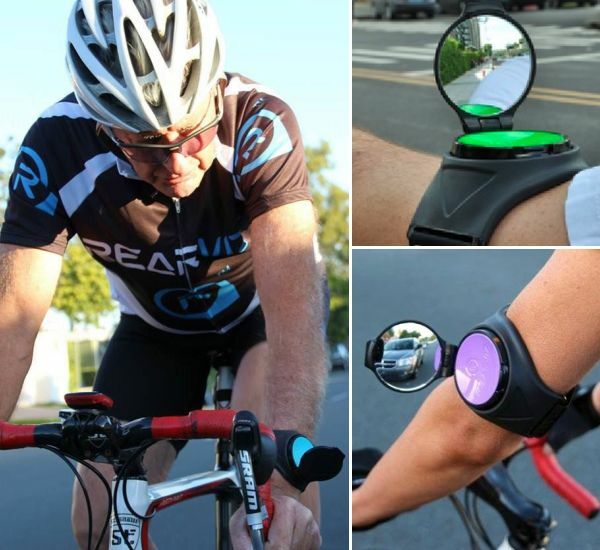 Anything you do to increase your level of safety is a good thing, and the Rearviz wrist-worn mirror pictured above is as good an innovation as we’ve seen lately. Featuring a convex mirror for a wider angle of view, the device allows you to see what’s behind you without having to contort yourself away from the road in front. It’s made from waterproof materials and features a pouch to insert contact information as well as medical data that could come in handy if all your precautions fail and you find yourself on the way to the hospital. It comes in two sizes, one for the wrist and the other for the forearm and cost between $23 and $37. However we’re not exactly sure when it’s going to be available. By David Ponce on 08/07/13 • Leave a comment! If you want to pedal, but would like the assistance of electricity whenever your own energy starts to lack, you have limited options. You can either get an all-electric bike, which often looks bulky and tends to be heavy. Or you can try to retrofit your current bike with an often inelegant conversion system that requires lots of tools, and once installed, makes everything look very DIY, and weekend-tinkerer-y. The Rubbee fixes all that. 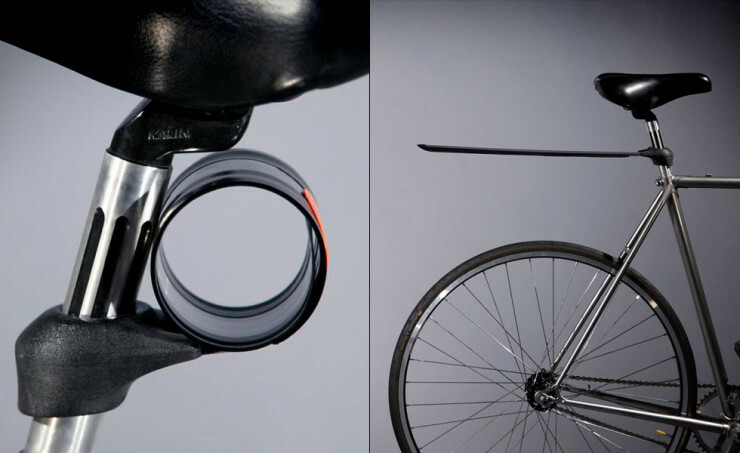 It simply attaches to your seat post with a basic clamp, and a motorized rubber wheel then rests atop your own bike’s rear wheel for propulsion. 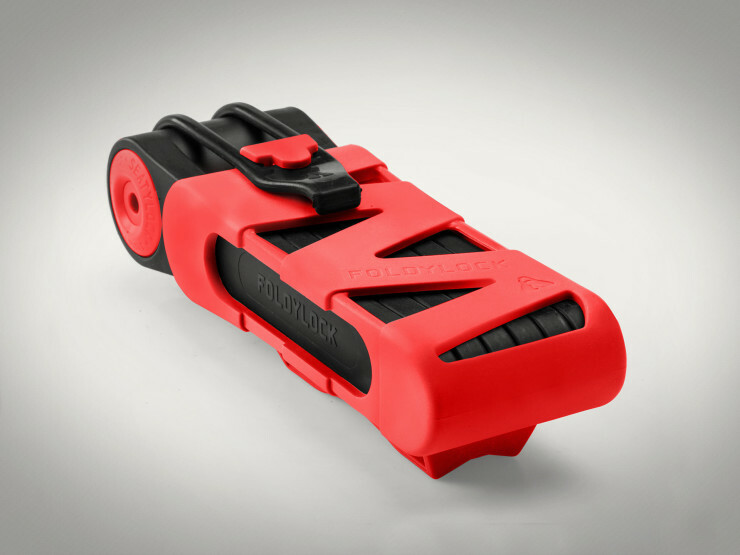 A 20,000 mAh battery provides up to 800W of power, propelling you at up to 25 km/h (15 mph) for one hour. That means it’s got a range of 25km (15 miles) incidentally, just in case your arithmetic isn’t up to snuff. The battery can be recharged in two hours, and is rated for up to 2,000 cycles without loss of range, which is a full charge a day, every day, for 5 years. The entire system weighs 6.5kg (14 lbs) and is controlled via a throttle that must only be installed once. Everything is waterproof, so yeah, you can take it out in the rain as well. 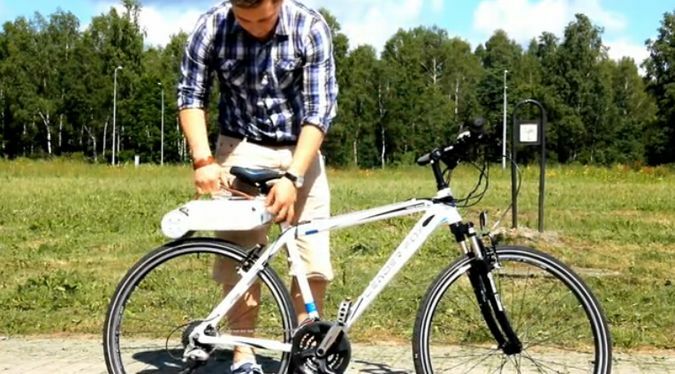 This seems to be a pretty comprehensive solution for anyone looking for some electric boost in their cycling efforts. Of course, it’s not cheap, currently undergoing funding on Kickstarter with a pledge of $1,225 USD getting you your own Rubbee. 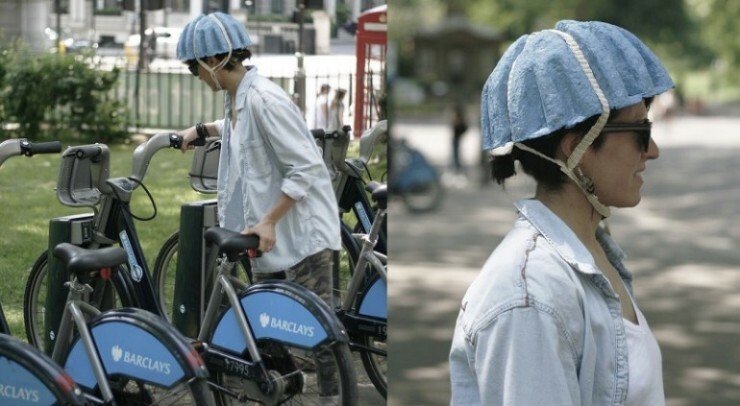 Is A Ridiculous Paper Pulp Bike Helmet Better Than Nothing At All? By David Ponce on 07/01/13 • Leave a comment! Keeping the contents of your head on the inside is a priority shared by many cyclists, thus the popularity of the bike helmet. But there’s a situation where helmets are rarely used: bike rental/sharing (like Montreal’s Bixi, NYC’s City Bikes or London’s “Boris Bikes”). Since most people don’t walk around with a helmet, they’re unlikely to have one when they decide to hop on a bike, so they ride without. The Paper Pulp Helmet concept looks to offer an alternative. Made from paper pulp derived from recycled newspapers, the helmet is vaccuum formed and can conceivably be sold for around $1.50, which is cheap enough to be paid for alongside a bike rental. The grooves that you see serve multiple purposes, like allowing for straps to be used, as well as providing aeration to prevent a wearer’s overheating. An organic additive is included in its preparation which makes the helmet waterproof for six hours. And when you’re done, simply toss it in a recycling bin and move on with your day. Will a paper helmet keep you safe? It allegedly meets “stringent European safety standards”, though even if it doesn’t, some protection is arguably better than none. And yes, this is only a concept at the moment, with no word on when or if it’ll ever see light of day. The Monkey Light Pro has 4 bars of LEDs which are attached together inside your wheel. As your ride the system rotates, and using Persistence Of Visio, creates an image with its 256 full color LEDs. The Monkey Light Pro has sensors to track its speed, heads-up position and rotation direction. This allows the system to create stable, full-wheel images from 10 to 40 mph (15 to 65 km/h). The images of course can be animated, and the system accepts files of several different formats, from GIFs to FLVs, by way of JPEGs or PNGs. There’s a 7000mAh Lithium Polymer which can give you from 3 to 8 hours of runtime at full brightness or up to 48 hours at reduced brightness (say you’re riding at night). When you order it, the Monkey Light Pro will come pre-loaded with 10 custom animations, but it’s relatively easy to load your own later on. The system will fit wheels of the following sizes: 26″, 27″, 28″, 29″, 700c. It’s a Kickstarter project for now, and Early Backer prices are sold out. So the cheapest you can get one wheel is $695, and $1,390 for a pair. Yeah… that’s a lot of money to attract attention. By David Ponce on 05/23/13 • Leave a comment! Riding your bike at night can be a little tricky, especially without headlights. 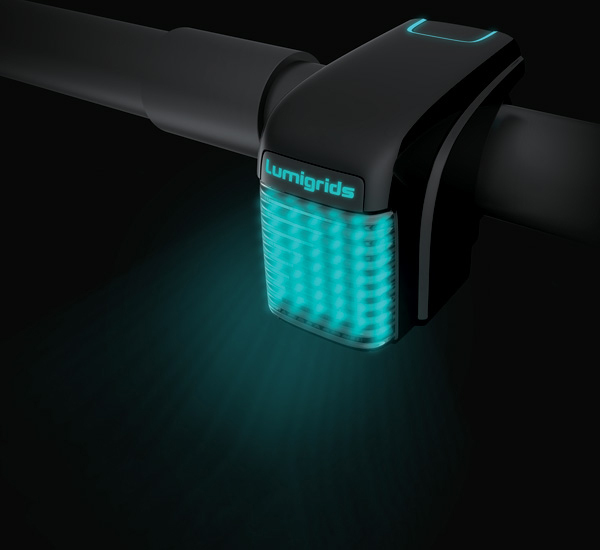 Regular headlights are great, but the Lumigrid is a conceptual LED light that would kick things up a notch. It can be difficult for night cyclists to get a good sense of the condition of the terrain ahead, even with a typical bicycle lamp. In many cases, a bicycle lamp will cast shadows on both concave and convex areas of the ground. This can hinder the rider’s judgment of the road surface ahead, and increase the potential for danger. Lumigrids can project a grid onto the ground. On a flat road surface, the grid will consist of standard squares. On a rough road surface, the grids will deform accordingly. By observing the motion and deformation of the grids, the rider can intuitively understand the landforms ahead. 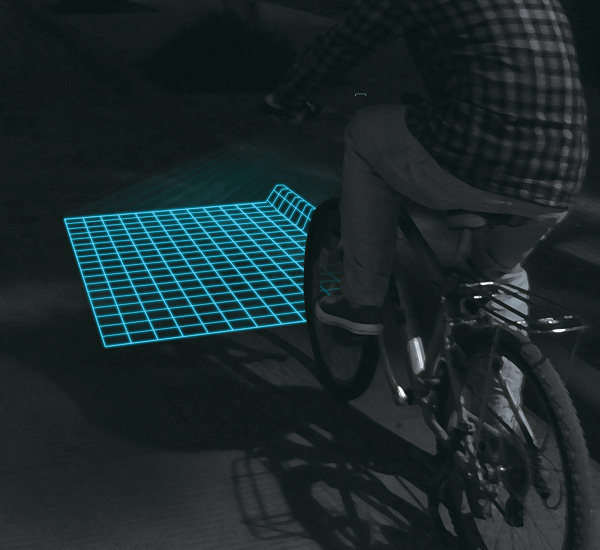 In addition, the luminous grids can make it easier for nearby pedestrians and vehicles to notice the bicycle, reducing the likelihood of collision. Unfortunately, it is just a concept at the moment, even if it did win Sichaun University a Red Dot Design award in 2012. There doesn’t seem to be any concrete plans for bringing it to market, but given the current state of technology, how hard could it be? By David Ponce on 05/21/13 • Leave a comment! Handlebars on a bike can be so much more than rests for your hands, a place to affix the brakes, and a way to actually turn the two-wheeled vehicle. With the Helios handlebar, you can add the following features: button-activated rear-facing LED turn blinkers, 500 lumen headlight, smartphone controlled ambient lighting, speed indication and even navigation assistance. The blinker functionality is pretty straightforward, but the others can use some explaining. The speed indication will have the LEDs progressively change colour as you speed up; red for slow and green for fast. The Helios uses the GPS in your phone (paired through Bluetooth 4.0) to not only determine your speed, but also to give you directions; just load up a course and it’ll interface with Google Maps’ cycling directions to light up the appropriate LED as a required turn approaches. How exactly you’re supposed to see the LED on the rear-facing part of the handlebar we’re not entirely sure, but we trust that some thought has been put into that. Finally, a low power GPS module is integrated into the handlebar itself. Just pop in a prepaid SIM card and you can track your bike from anywhere in the world, which is great if it ever gets stolen. All this for $200? That’s a bargain if you ask us. Heck, it’s even $149 in Early Bird pricing on the Kickstarter campaign that should get off the ground sometime today. Getting mud sprayed all over your back when you’re riding is fun. Ok, no, it’s not. But mudguards are often badly made, unsightly, and people generally tend to avoid them. If they had the Plume, pictured above, they might change their mind. Made from stainless steel and a flexible polymer, the Plume “extends out into a sleek mudguard or recoils back into a tight circle under your seat with the gentle press of a finger, even if you’re in motion.” The action is much like that of the snap bracelets of your youth, and doesn’t require springs, or any special mechanism. It’s $35, currently on pre-order on Kickstarter. People are fond of saying that you can’t reinvent the wheel, but if you take a look a the LoopWheel, you realize that’s not entirely true. The device uses a regular, off the shelf tire, rim and hub, but it replaces the common spokes with a flexible carbon-composite system that gives suspension directly to the wheel. By making the new loopy “spokes” flexible, the LoopWheel’s hub is able to go off-center by as much as 45mm (1.7 in. ), effectively giving it a suspension with 1.7in of travel. Granted, that’s not mountain bike material, but the LoopWheel isn’t intended as such. Currently only being produced in a 20in. size (a small bicycle wheel size), they’re intended to be used in folding bikes or any other compact bikes that wouldn’t normally be able to fit a regular suspension system. 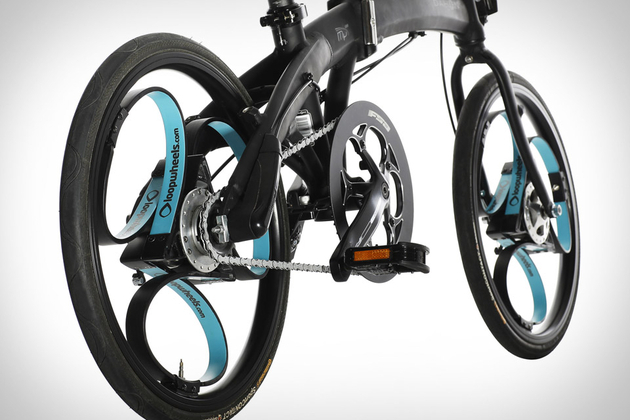 Like many innovative items, the LoopWheels are on Kickstarter, but they’re fully funded. If you still want to get in on the action, it’ll cost you 490£, or roughly $763. Hit the jump for a video of the wheels in action, plus links.